The Football Association is investigating alleged coin-throwing incidents at Stoke and QPR on Saturday. 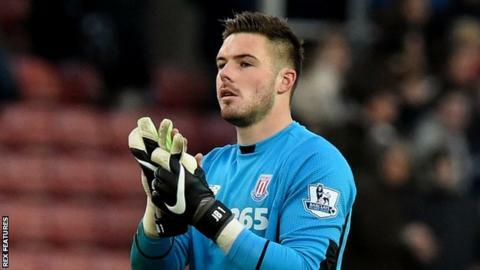 An object was allegedly thrown at Stoke goalkeeper Jack Butland during his side's 2-1 victory over Aston Villa. QPR players were apparently targeted as they celebrated a goal in their 2-0 win over Birmingham in the Championship. Police made three arrests; one for racially aggravated assault on a police officer, one for entering the pitch and one for a Public Order offence. All three men arrested at QPR have been bailed pending further enquiries. The FA is already looking into an incident in which West Brom's Chris Brunt was struck by a coin at Reading. Police have made an arrest after the midfielder was hit on the face by the coin, thrown from a section housing West Brom fans, after he went to give his shirt to a supporter at the end of the Baggies' 3-1 FA Cup fifth-round defeat. QPR have begun their own investigation into the incident on Saturday, while Birmingham have promised stern action against anyone found responsible. A QPR statement said: "A coin from the School End stand, in which the visiting supporters were situated, was thrown towards the Rangers players as the Rs celebrated their second goal in our Sky Bet Championship fixture at Loftus Road. "The club will continue to review video footage and liaise with the Metropolitan and West Midlands police." A Birmingham spokesman said: "If anybody is found to have thrown a coin, we will take the strongest possible action. As a club, we utterly condemn that sort of behaviour. "We will be liaising with the relevant bodies, including West Midlands Police, to investigate such allegations."